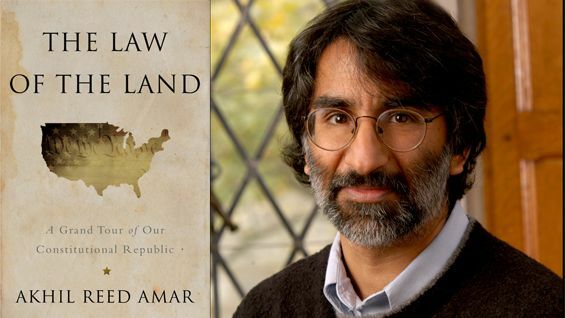 Akhil Reed Amar, Sterling Professor of Law at Yale University, discusses his new book, Law of the Land: A Grand Tour of Our Constitutional Republic in a free, public lecture. In the book, Amar tells the story of the American constitutional system through the lens of geography. "Basic topographic features matter for key issues of constitutional law," writes Amar. "The wideness of the Atlantic, the flatness of the Midwest, and the centrality of the Mississippi were all important factors influencing the Founders' and Lincoln’s views of the secession question," he notes. Zeroing in on twelve individual states – Illinois, Alabama, New York, California, Kansas, Iowa, Florida, Ohio, Texas, Wyoming, Massachusetts, and New Jersey – Amar focuses each chapter on a particular person, case, idea, or event associated with that specific state (or the broader region of which that state is a part) to show geography’s impact on constitutional interpretation. Drawing on legal, political, and historical material from every era of our nation’s history, The Law of the Lands' "grand tour" begins with profiles of four of the most influential constitutional decision-makers in American history: Abraham Lincoln (whose "Right Makes Might" speech was delivered in The Great Hall), Hugo Black, Robert Jackson, and Anthony Kennedy. As Amar shows how their respective home states – Illinois, Alabama, New York, and California – shaped their motives, thoughts, and decisions, he also touches on the broader implications for our national constitutional system.